Two years ago, when the first edition of When Light Dawns was released in 2015 I remember laying in my bed, stunned that my second book was actually in print. I was in the midst of my first treatment round with IV antibiotics and was extremely sick so the book release at that point seemed unreal. In fact, just 11 days before the book release I had started an extremely intensive treatment round that included all day antibiotics. To be frank the book release was a whirlwind. There were no book release parties, no big dinner celebrations, and to be frank there were many tears behind the scenes due to being so sick from treatment. In many ways, as I look back on that time, I see that it was very symbolic of the Christmas season when Jesus was born. It was difficult and it was messy, and in my own way I felt that I was in a stable. And honestly it makes me smile. When Light Dawns, the first edition will always have a special place in my heart. It was truly born out of love and a desire to encourage Lymies who were struggling in the midst of the "joyful" holiday season. I so related to this as I often wept through the days almost wanting the Christmas season to pass. When it is a struggle to breath and live this season can feel overwhelming. As I think back to that season and to how far the Lord has brought me in these past two years, my eyes well up with tears. It has been a long and tiring battle but the Christmas season has remained for me a beacon of hope against many dark and moonless nights. As I think back to having this book end up where it has I am truly overwhelmed that there are more than 10,000 copies of of this little book in print and that it is being translated into several different languages. It seemed fitting as we approach the Advent and Christmas season for a 2nd edition to come along. This second edition has been updated and expanded but still includes the 40 day devotionals that offer a reflection on the Advent and Christmas season, along with a song. 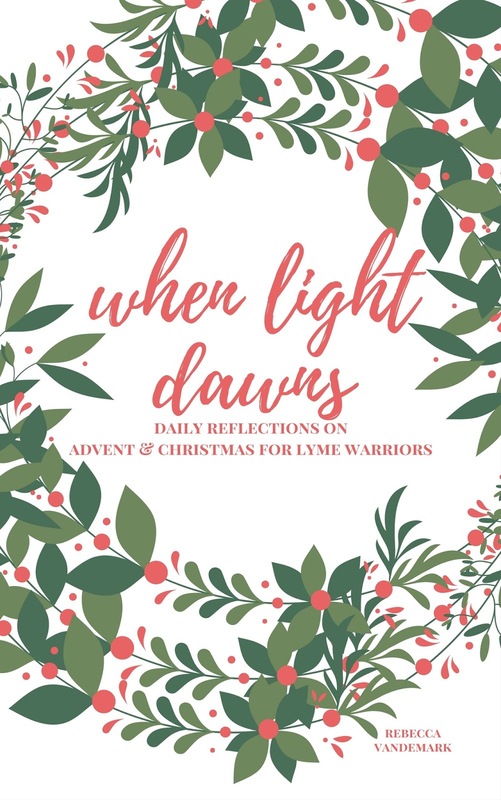 While this book could be read for anyone with a Chronic Illness, the book is the first and only Lyme patient specific book for Advent and Christmas. The book can be used as a simple encouragement to the weary heart or as a guided devotional study. My prayer remains the same that this little book will provide spiritual encouragement and give new meaning to the popular phrase, "Holiday Preparations". I am SO excited to announce that it the 2nd edition of When Light Dawns officially released this morning!! You can purchase it where books are sold or on Amazon (also available in Kindle form) and you can click HERE to purchase it! Thank you to each of you that have already purchased it!! If you have a chance will you take a moment and leave a short review? Thank you!! Thank you so much to ALL of you that have been walking this journey with me in prayer! TRULY you are a blessing!! "The Light shines in the darkness and the darkness has never extinguished it."